Already providing schools and organisations with a low-cost, easy-to-use solution, NetSupport Notify is designed to support emergency and lockdown procedures by delivering one-way alerts and notifications to desktop users that cannot be skipped, ignored or saved for later – making it quicker and more effective than emails. In its latest update (V4), new features and enhancements have been added to make this desktop alerting and notification solution even more effective. 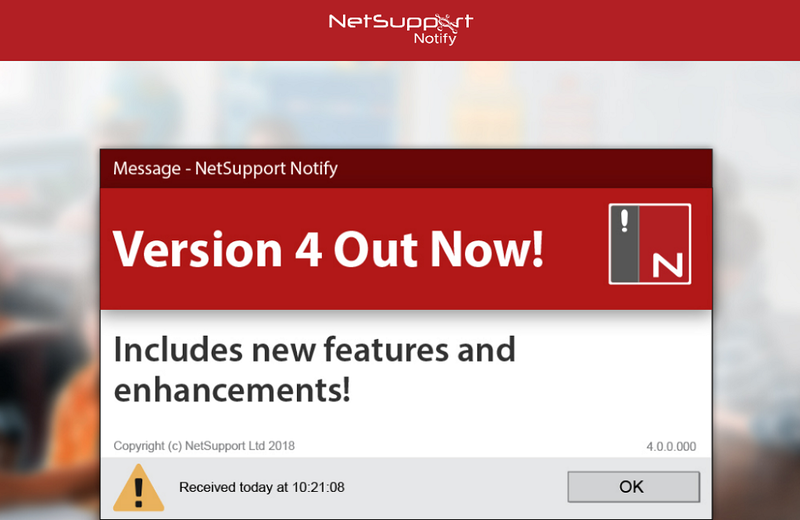 In addition to an updated user interface and increased character limit, NetSupport Notify now includes three new hotkey combinations to stop emergency response messages being accidentally sent; Active Directory templates to help save time and avoid manual set-up; message display updates so notifications will appear on computer screens even when they’re locked; support for IPv6 addresses, and new Active Directory names to find recipients easily. To learn more about the latest updates and enhancements, click here.